The average price of marijuana has steadily dropped since legalization. Marijuana prices have plummeted since stores opened last summer, and the average gram of marijuana in the state’s system now goes for about $12, according to the state Liquor Control Board (LCB). When prices peaked last summer, a gram was fetching about $30 on average, according to data from the LCB. 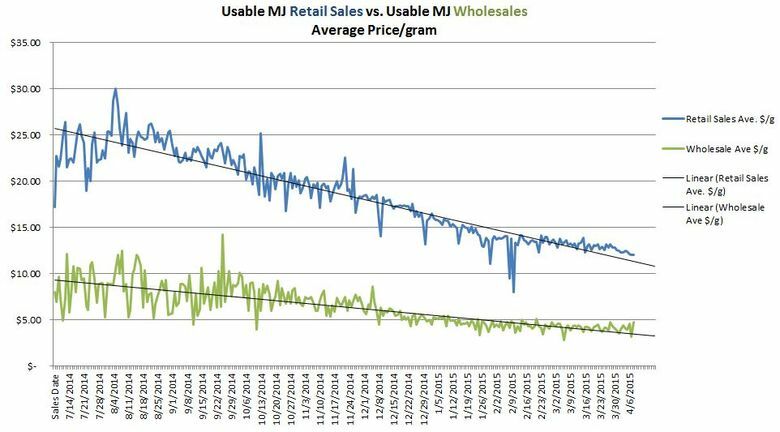 The aggregated data doesn’t consider the quality of the bud or the effect of bulk pricing, but shows a clear downward trend since the state launched its regulated marijuana market. Brian Smith, a spokesman for the LCB, said the agency was pleased with the trend. When stores opened, retailers faced a shortage of pot. Within months, the market took a U-turn and suppliers began to worry about a glut of pot on the market.